Formed in 1911, Amateur Radio Victoria continues to play an important role in amateur radio affairs. Since the nationalisation of the Wireless Institute of Australia, it is now more focused on state matters, but remains committed constitutionally and through its membership of the WIA to the continued access to radio spectrum by its members. It has a proud history of advocacy including participation in government inquiries including those on television and radio broadcasting and also a review into the response of the Ash Wednesday disaster and discussions concerning municipal planning laws. 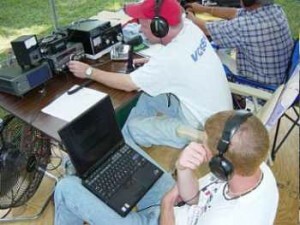 Helping to grow the hobby of amateur radio and increasing positive public awareness of it remains among its major goals. It actively participates in many areas including the International Lighthouse and Lightship Weekend, through the VK3RAN station on HMAS Castlemaine and the World Amateur Radio Day. Through its revised website and voluntary office, it is often the first contact for inquiries from the general public. We are the source of regularly scheduled Foundation Licence training and assessments. Occasionally it runs a famous Bridging Course to enable the upgrading of qualifications. Help is also given on deceased estates. The state-wide organisation maintains an extensive network of repeaters and propagation beacons, a weekly broadcast and is building a new emergency communication facility following the Black Saturday Bushfires. Through its funding it has enabled the digitisation of the Amateur Television repeater VK3RTV and supports the regional Bendigo ATV repeater VK3RBO. It continues to be a leader and active in many fields and has quarterly meetings with special speakers on topics of interest. Members know that VK3 QSL Bureau and other services are value for money.